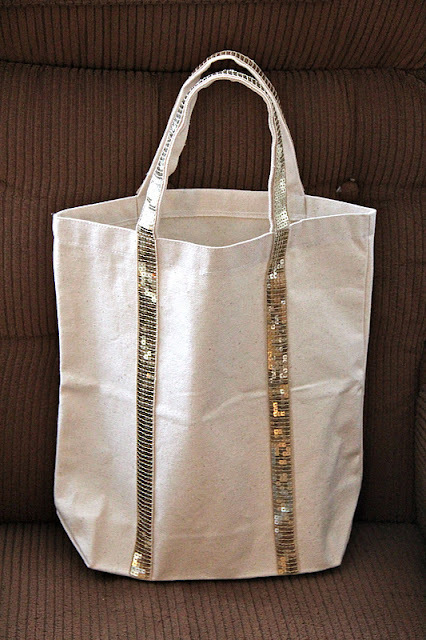 When I saw the idea for a DIY sequin tote on Anna's blog, I knew I had to make it! 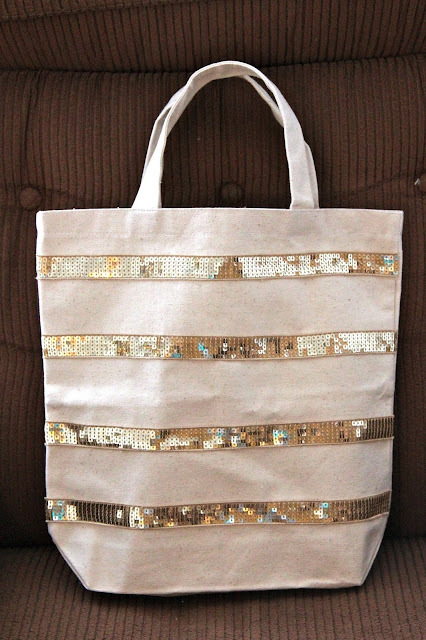 I used sequin trim and a canvas tote from Hobby Lobby, and I attached my sequin trim in horizontal stripes with hem tape (above tote). Then I saw this tote and wanted to make own version. Using more of the same supplies, I ran the sequin trim around the handles and down the length of the tote on both sides (below tote). Such a quick and easy DIY, and I always need another bag! This is super cute Sherri! Very cute! My daughter would love to have one of these! Wow I LOOOOOVE this! So easy and glitzy! Oh em geee. You did this yourself?! I don't need any more tote bags, but when I wear all of the others out, I'm definitely going to be making this, but in PINK sequins. And maybe on a green bag? Overly preppy much? I think not ;) Happy Thursday, Sherri! So cute gal! And it looks like it is easy! I love this! I am so trying it! Yours came out so well! Oh my goodness...so so cute. Love how it turned out! Sherri! I love this and want to make one too. But where do you get hem tape and what is it? Thanks! Love and miss you! Cute! I need to throw out my market totes as they are getting kind of tattered and gross. Maybe I should make some new sparkly ones to take to the grocery store! look at you lady! creating so much. these would be amazing gifts too. So cute and practical and fashionable. I agree with the above comment. You should sell these! @Sandy - hem tape is a double-sided tape that you can use on fabrics. I bought mine in the sewing supplies section at Michael's. I think any craft or sewing store would have it! So cute! You are so crafty!! I love the way this came out! Great job, lady.